There’s a lot of new features in Enterprise Manager 13c (EM 13c) that the DBAs will love. One of the things I’d heard customers complain about was the lack of visibility into the statistics jobs that run in the target database using DBMS_SCHEDULER. The enhanced DB Optimizer Statistics Console provides a central place to manage database statistics, view a summary of all object status, and the status and performance of the statistics jobs that have run. To access the console, from a database target select Performance / SQL / Optimizer Statistics. The Operations, Configure and Status sections haven’t changed much. In the Operations section you can Gather, Lock, Unlock, View, Restore and Delete statistics. 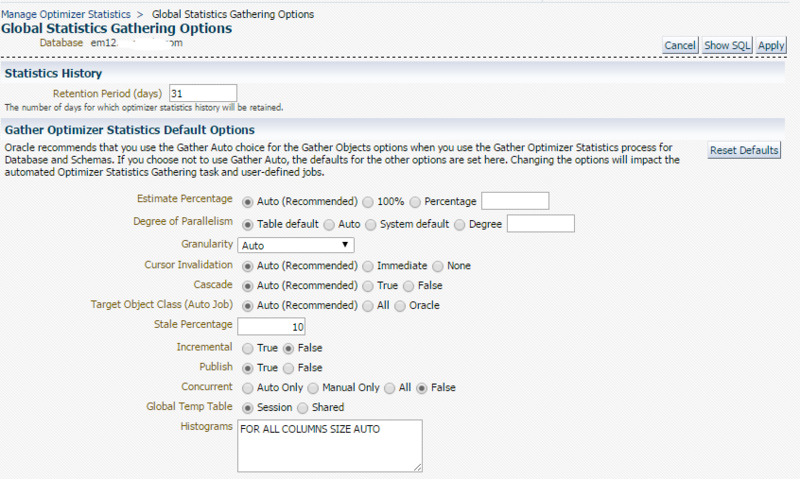 From the Configure section you can easily adjust Global Statistics Gathering Options, Object Level or make changes to the Auto Task and view SPA Validation Results. The new notable new features here are the breakdown of Statistics Gathering tasks and the Jobs List. From the chart, you can quickly see if you have job failures that might be affecting your performance. In the status chart, you can identify if you have State statistics that need attention. Drilling down into the Statistics Gathering Job List or Auto Tasks will bring up a detailed report of the job run. Not a huge change, but hopefully one that will make the DBA’s life easier and provide better insight when evaluating database statistics!